Weekday evening programming on the largest cable and broadcast news outlets almost completely ignored a long-standing Medicare privatization scheme favored by Speaker of the House Paul Ryan (R-WI) in the days since he first resurrected the idea of radically reshaping the American health care system toward for-profit interests. According to a July 19 issue brief from the Kaiser Family Foundation, conservative lawmakers are likely to pursue “a proposal to gradually transform Medicare into a system of premium supports, building on proposals” adopted by Ryan when he served as chairman of the House Budget Committee. These so-called “premium supports” would provide each Medicare beneficiary with a “voucher” that can be used for the purchase of private health insurance; they represent “a significant change from the current system” that pays health care providers directly for services rendered. In essence, Ryan’s plan would privatize Medicare and redirect hundreds of billions of tax dollars that currently go to doctors, hospitals, and other medical service providers through the costly private health insurance market. This startling scheme bears similarities to a failed 2005 attempt by the Bush administration to partially privatize Social Security. Democratic members of Congress are already aligning themselves against Ryan’s throwback plan to gut Medicare, and it’s not actually clear if Trump is supportive of the initiative, which he refused to fully endorse on the campaign trail. As the Center on Budget and Policy Priorities (CBPP) pointed out last July, claims that Medicare is “nearing ‘bankruptcy’ are highly misleading,” and Ryan’s specific charge that Medicare is “broke” because of the ACA is completely wrong. President Obama’s health care reform law greatly improved Medicare’s long-term finances and extended the hospital insurance trust fund’s solvency by 11 years. 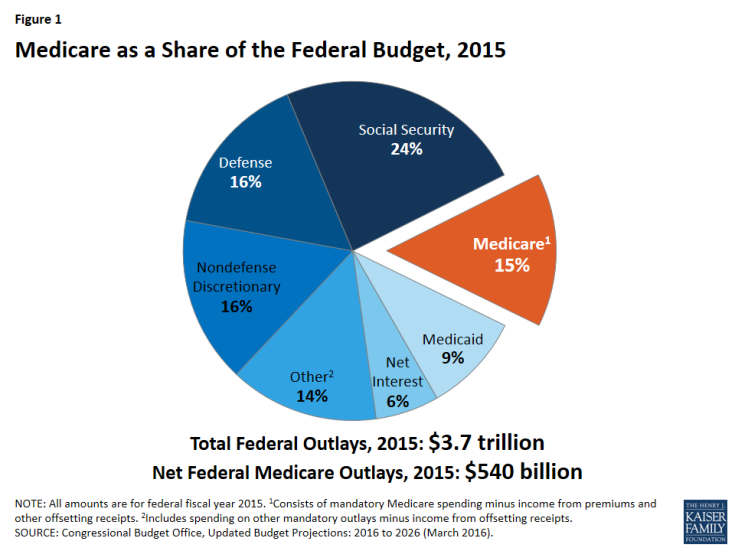 The looming fight over the future of Medicare, which serves over 55 million beneficiaries and accounted for 15 percent of the entire federal budget in 2015, has been well-documented, but it has garnered almost no attention on major television news programs. Millions of Americans who rely on broadcast and cable evening news are completely unaware of the stakes in this health care policy fight. They are also unaware that Ryan’s privatization scheme would leave millions of retirees at the whims of the same private insurance market that right-wing media are currently attacking because of increased rates. Watching the dumbasses who voted for Trump as they come to understand that he plans to ruin their lives is going to be my new hobby. Oh I’m so totally with you on that one. That and “helping” them understand it. Hey exactly how many sockpuppets are there on this site for the Trolls? I notice that nearly every “super troll”… i.e. Otto, Aglandickhead, and the others are ALL suddenly off air. Simultaneously. I’d expect one or two to drop out every once in a while if they were individuals… are they really all the same person/organisation just with multiple puppets? It’s just very weird that all the worst offenders seem to be silent at the same time. Like you said on another post: It’s as if they are paused, waiting for new marching orders, or have been redeployed elsewhere. Clearly you are on to something, and not a paranoid retard. Maybe putin needed them for something. No, they’re just practicing their Hitler salutes and the high-stepping parade steps for Trumps inauguration parade! We are all the same Russian state-sponsored hacker. yes, they are all Russian/Trump paid trolls who were supposed to get paid by the number of comments they garnered. My guess is Trump stiffed them. No surprise. That’s because enough people got fed up with them and blocked them. I despise the sick Cons as much as the next guy, at least if the next guy despises sick Cons with a burning hatred and disgust, hehehe. But I’m not sure they will ever learn, it’s the reason they have the disease in the first place. I still take great joy in ridiculing and reminding them each day what horrible human beings they’ve become. But in my mind I think the best hope we have is like Bernie suggested to have millions gather in D.C in protest. And I would even go further and say shut the system down. There’s no point in trying to convince Cons are hoping that morons who have never been able to figure out the causes for their problems will suddenly figure it out with more pain. Na, I think energies should be directed to reminding the powerful that not only are the thinking people not afflicted with the Con sickness are a majority and we are a majority that will no longer allow their kleptocracy to continue regardless of what ignorant fundies believe. And it needs to movements of people, not the donation machines of the Democratic party, that seems to be all they ever want is money, what o they do with that money? Nope, we need organizations that still may need money but that are using that money to charter buses to DC. I will also enjoy watching all these incredibly ignorant people squirm and attempt to understand what is going to happen to their lives going down the toilet. However being over 70 and being both on Medicare and getting SS, unfortunately I and all those who think like me, will suffer as well, and more troubling are my children and following generations will not have the comfort of knowing they have the guarantee of their government that when they reach that “golden” age to receive SS and Medicare that they have invested in through their payroll taxes regardless of what happens in the private sector “investment” products, IRA’s, 401k’s, Roth IRA’s etc. will be there for them come Hell or high water. And those private sector products are at the mercy of crooked Wall Street creatures who tend to be far less than honest and are far too greedy than any human has a right to be, along with many businesses who deduct contributions from employees income to “invest” for them in pension plans that all of sudden disappear when the business goes belly up, too many horrible stories to count on the many ways the little guy gets shafted. But SS has always been there, and can be strengthened for decades to come with a little thought and good faith work!!! I want to be clear that I don’t really enjoy watching people suffer. But sometimes I have to admit there’s a certain amount of cosmic justice at work. Maybe that Buddha guy was on to something. Paul Ryan intends to create major pain for all Americans including Trump loyalists. I recall Trump saying there are some people in the party he would keep and some he wouldn’t have uses for. I think Ryan’s days as speaker are short! He’s going to have to hold the party together in all its various and sundry components and he seems to be strongly wedded to his long held pet plans to starve the beast much of that seems to run contrary to Trump’s promises to a public that has been deeply injured by the beltway permanent political class like Ryan. I just think “drain the swamp” applies to the likes of Ryan as SOTH. As wonderful as that may sound, the President has no control over who the House and Senate pick for their leaders. They are not his corporate flunkies he can hire and fire at will. In fact, out of all the congressional leaders, Ryan has the potential to be the most dangerous to Teflon Donnie, as he is the one who is empowered to establish a committee to determine if the President should be impeached for “High Crimes and Misdemeanors”. Trying to usurp Congressional Authority is definitely part of that, so Teflon Donnie needs to take care in what he tries to do. 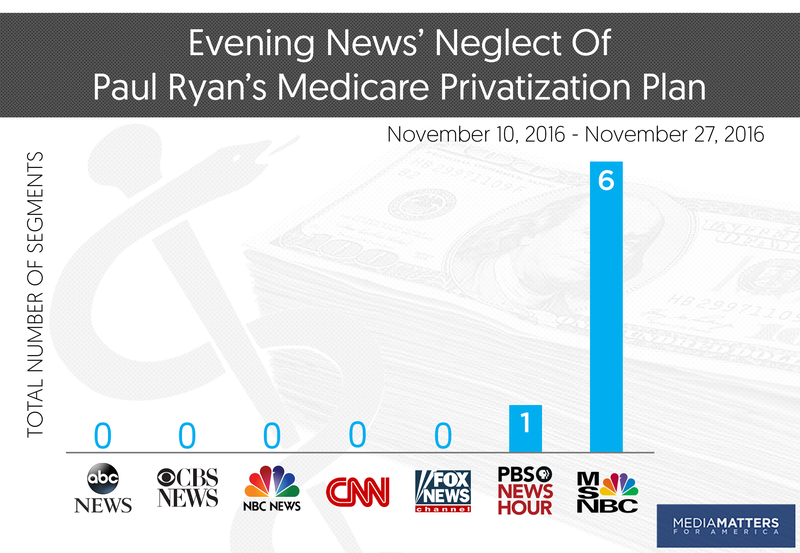 The reason the media ignored Speaker Ryan’s renewed efforts to replace MEDICARE with a voucher system, privatize SS, repeal the ACA, and trash MEDICAID, is probably because this is old news. Slashing social programs was one of the main components in Paul Ryans 10-point plan when he was Romney’s running mate. The difference now, is that the GOP has full control of Congress, the WH (starting in a month and a half), and soon the SCOTUS. Much depends on how much Republican congressmen and Senators are willing to risk when they run for re-election. They all know that one of the most determined constituencies in the USA are senior citizens, and that messing with our livelihoods is political suicide, even if Ryan’s plan only affects those under age 55 when it comes to SS and MEDICARE. I wonder if he knows that million of seniors use MEDICAID to pay for assisted living facility costs? He’s been preaching this lie with the added ACA lie for years. such a lying idiot. This has been his end game. NOW, with the abundant lies told about ACA, he adds a lie to it, also. these miscreants rule all and none has any moral fiber, sense of right or wrong. Quark is a Ferengi(Star Trek N G), Stereotypically capitalists and motivated only by profit. Fits him and he looks like him. Paul Ryan,is the weasels weasel! Why would the “news” media talk about Ryan’s Medicare plan when they had “emails” and “Benghazi”??? Plus, wasting away their time that should be actual news stories to give Donald free time. Unfortunately, people today have short attention spans and are too lazy to sort out the truth from the multitude of falsehoods out there. How else to explain why so many vote against their own self interests or listen to a con man and believe him so easily. If you had any knowledge of Paul Ryan and extreme conservatives, they are pretty much “Buck up people, you’re on your own.” Government help is no good. You don’t need it; that is until you need it. Just yourself, not “other ” people. Of all the countries in the world, the US is only #1 in our military. We are down the list for all other metrics of a great country in which to live. And we are placing the Republicans in the driver’s seat to improve this? God help us all. The Trump voters are going to suffer greatly from the privatization of Medicare. Red states, the poor states, are going to be saddled with paying their own states Medicaid costs instead of the feds taking money for rich blue states, like NY and CA, and giving it to the red states for their indigent health care covered by Medicaid. And then there is the coming change in Social Security due to privatization of that program. They have already said benefits will be cut, eligibility age will be raised, and the system will go private so each person will have a tax benefit to saving themselves for their retirement instead of deducted payments going to Social Security for their future. It’s going to be painful for the working and middle class. Lyin’ Ryan has no principles other than enrich his owners in business. He would be insane to actually believe that profit driven businesses would be cheaper or more efficient. He would be insane to believe they will put the good of the individual ahead of maximizing profits.Of course he is not insane and knows better. He just doesn’t care. This is the problem with our current news media…..they give us crap, but they don’t report on the actual things that we, as a nation, care about! I guess they think if we don’t read about it, we won’t care what happens to our lives! The all consuming obsession of Republicans to dismantle, destroy, eliminate all of the “New Deal” to prevent what was the worst economic collapse in history of the modern industrial world and provide a safe future for the most vulnerable, the elderly along with the “Great Society” to eliminate poverty, to protect the elderly, and attempt to eliminate racial injustice, has been an unending question, WHY? The programs implemented by FDR and LBJ that has improved the lives of millions of Americans directly and substantially improve the quality of life for Americans for almost 80 and 50 + years respectively and counting along with the passage of ACA by Pres. Obama, and the Republican all consuming fixation to kill what has improved life for millions along with moving this country to a more perfect union, has been a continuing source of befuddlement, confusion and anger. For decades I have listened to Republicans threaten continuously attack SS and Medicare, almost all financial regulations, the Civil Rights Bill, the Voting Rights Bill, all created to keep greed at bay, or improve the quality of life for the majority of Americans in the most fundamental life improving ways, provide unrestricted access to the ballot box and address our original sin, racism and bigotry. And yet, with particular mention the last 15 to 20 years, all has been either ripped apart i.e., the Voting rights act by a right leaning Supreme Court, Glass-Stegall repealed by of all people a Democrat in Bill Clinton, and the insistence of “privatizing” SS and Medicare which seems to be Paul Ryan’s mission in life. a real threat now and am certain along with an idiot president like Trump and ill advised advisors and the “cabinet” he’s selecting, who to a person, all hate these programs, the THREAT is real. This is what I know, PRIVATIZING means someone or some corporation is going to make an obscene amount of money, as they are in business for PROFIT, not for a hobby, and that means if services are cut to improve the “bottom line” a give out fat bonuses, gramma and granpa too bad, so sad, and I would like Paul Ryan to give me the name of one insurance company whose dying to write insurance on an 80 year old man or woman times millions, no profit, top high a risk, no reward!!! And a $5000 annual voucher, really??????????? By the time my husband and I reached Medicare age, 65, we were paying $25,000 a year on premiums for average health insurance policy and both of us in good health. And that was “cheap” comparatively. Another crash in the market like 2008, kiss off your “privatized” SS, but I assure you the CEO of what ever company manages you SS dollars, will be richer than God…………….All I can say is screw the Republican Party, I will fight and speak against what they are doing anyway I can, and hope the idiots that voted this party into complete power, will pull their collective heads out of the their asses and stop simply hating people of color, people of religious minorities, and every contemptible social issue the Republican Party uses to win elections in the most destructive and divisive ways, and they will all see what really is going to affect their lives, because all the rest is nonsense, everyone’s quality of life is about to be threatened big time!! !